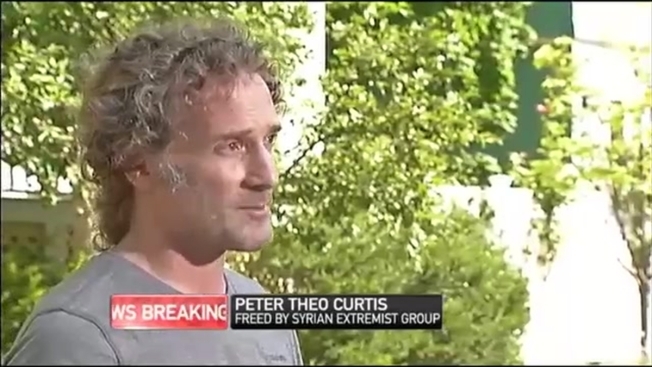 Freed Hostage "Overwhelmed by Emotion"
Freed American hostage Peter Theo Curtis said Wednesday he's "overwhelmed by emotion" after learning that hundreds of people worked to secure his release. "In the days following my release on Sunday, I have learned bit by bit that there have been literally hundreds of people working for my release," Curtis said, speaking from outside his home in Cambridge, Massachusetts. "They've been working for two years on this. I had no idea when I was in prison that so much effort was being expended on my behalf." The American writer, who was held hostage by an al Qaeda-affiliated group in Syria for 22 months, was freed over the weekend and returned home to Massachusetts on Tuesday night, where he was reunited with his mother. "I'm overwhelmed by emotion. I'm also overwhelmed by total strangers saying, 'We're just glad you're home. Welcome home,'" he said. "I suddenly remember how good the American people are and what good they have in their hearts. To those people, a huge thank you from the bottom of my heart." American Held Hostage in Syria Reunited With Family in U.S.
Curtis spoke for only about a minute or so on Wednesday. He did not take any questions or address the details of his captivity. He said needs time to bond with his mother and family and promised to speak with the media at a later date. "I'm one of you and I know what you guys are going through," he said. "But I can't do it now."